I wasn't sure what to expect from Abduction of Eden (called simply Eden in its theatrical run). I knew it received excellent reviews and that it was directed by emerging Seattle filmmaker Megan Griffiths, whose last movie was the micro-budgeted, nicely observed The Off Hours. But the subject matter—true-life* story of Korean-American teen abducted into human trafficking ring—was a tough sell, loaded as it was with predictable melodrama and potential agendas. I knew from reviews that Griffiths was taking a restrained, less exploitative approach, but that also gave me pause: how do you tell a story of forced teenage prostitution without getting a little down and dirty? It's like watching those American actresses (they know who they are) play strippers who don't actually, you know, strip—Hollywood prudishness at its least believable. Still, despite this and the unfortunate title change, I remained intrigued by the film for the obvious intelligence and vision Griffiths brought to The Off Hours, a small-town slice of life that paved little new territory yet captured its characters and milieu with an admirable confidence and empathy. I was curious to see what the director would do next. Turns out, quite a lot. 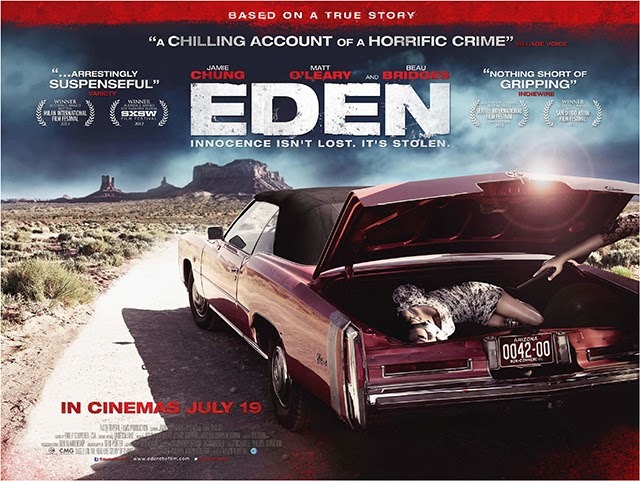 Even with the overly familiar B-movie trappings, Eden is extremely effective, often in surprising ways. Griffith's approach--straightforward, unsentimental, devoutly humanistic--serves the material well. Central to this is Jamie Chung's smart, unlikely performance as Hyun Jae. A former MTV reality star and the go-to eye candy in movies like Grown-Ups and Sucker Punch, Chung serves notice that her talent goes beyond mere beauty. Navigating her character's evolution from terrified, braces-wearing victim to patient, calculating survivor, she never stops watching and learning, even during those soul-crushing moments confronting the hopelessness of her situation. As fear and willfulness give way to pragmatism, Chung never loses touch with the desperate girl beneath the increasingly resourceful woman. The tightrope her performance balances on is mirrored in the fragility of her character's plight, where every step of the way she must question how far she's willing to go to survive, and how much of her humanity it will cost her. But the film's success doesn't rest on Chung's performance alone. Generating sympathy for the victim in a story like this is easy enough. But what if we actually feel a twinge of sympathy for the bad guys--especially guys as bad as this? Kidnapping, drug running, enforced prostitution--that's about as evil as you can get, right? Surely anyone capable of such acts is a complete monster. And yet Beau Bridges' corrupt Nevada marshal who runs the brothel brings enough paternal concern--and worry over being found out--that we can't help occasionally wanting to like him. Even the facility's worn-down nurse seems to genuinely care for the girls she's responsible for cleaning up and sometimes drugging. By avoiding twirling mustaches and obvious political agendas, Griffiths makes Jae's situation all the more terrifying for being so believable. The same ambiguity is apparent in Vaughan, the facility's chief administrator, whose level of self-disgust can't be erased entirely by a nasty crack habit. Played with believable live-wire impatience by Matt O'Leary, Vaughan is making the best of a business he's fallen into after serving as a soldier in Iraq--a business whose slippery career ladder he's determined to climb despite the marshal's regular needling and his own shortcomings. Jae, smarter and older than the other girls, presents herself as a natural ally. The miracle in O'Leary's performance (and Griffith's direction) is that you want to believe there's still a shred of decency left in him, not only for Jae's sake but for his own. And yet for all the humanity they recognize in each other, it's mutual self-interest that allows them to become confederates--self-preservation as humanizing balm. As the film takes on unexpected—and often violent—contours, the tension carefully builds, aided considerably by Sean Porter's soft, classically lit camerawork and an unobtrusive score that melts its way into scenes with emotional precision. There's a lushness to the sound and images that imparts a distinctly subjective, at times lyrical, viewpoint to moments that seem to otherwise unfold beneath an impartial documentary gaze. Griffiths has a real knack for imbuing her scenes with this tension in a way that remains subtle without putting you to sleep. There's never any mistaking the good guys from the bad here, but it's a sign of the film's artistry that you find yourself wondering: Are men evil or just weak? Do they create the system they serve or does it create them? Can one regard a violent captor with compassion—just one more human coping with his own limitations? How much complicity is allowed in the name of survival? These may not be questions you'd expect to ask while watching a film with subject matter as black-and-white as human trafficking, but it's those shades of gray—and the performances behind them—that keep you riveted. *Since this review was published, some doubts have been thrown on the credibility of the source material. 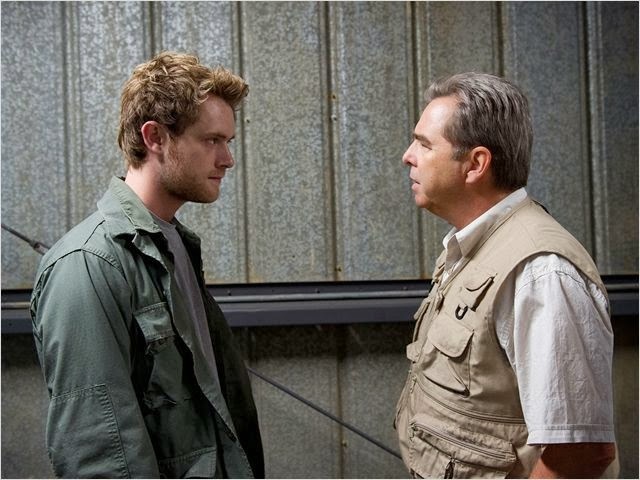 But whether based on truth or not, the film remains a gripping watch.